Yes, you enjoy your backyard, but what about your dog? If one of your family members is a dog, having a backyard you can call your own, where you are able to let them outside without the worry of them getting ran over by a vehicle or lost, is a blessing. Because it may be hard for them to stay comfortable or interested in empty space, you can create a backyard that is dog-friendly and more appealing. Yes, the ground is covered with snow now, but those warmer days are just a few months away. When summer heat is here, our dogs need to keep cool, and having a small dog fountain set up is great for this and helping them play and have lots of fun. A small fountain can be easily built, or you may invest in fountains which are dog-activated that connect to your house or garden water tap. If your dog is big, you know washing her or him can be difficult in a bathtub. Take advantage of nice weather – have an outdoor shower for your dog. Not only is an outdoor shower convenient for bathing, you can use it for rinsing off their paws quickly before you let them inside. Before using the shower, be sure to check the weather. They may be no need to have a dog house if your dog lives inside the house with you; however, you probably need a spot for a dog potty. A dog potty can keep both you and your dog happy. You can build this on your own, or you can have a landscape designer incorporate a dog outhouse in your yard’s design. There are lots of things that can be done to save your grass while giving your dog a designated spot to attend to business. What About a Dog Sandbox? Even if your kids are grown, if you’ve got a dog a sandbox could still be a good idea. A dog sandbox provides a place for active playtime that doesn’t necessarily require you to play fetch. While you are busy, your dog can have fun and stay entertained in their sandbox. 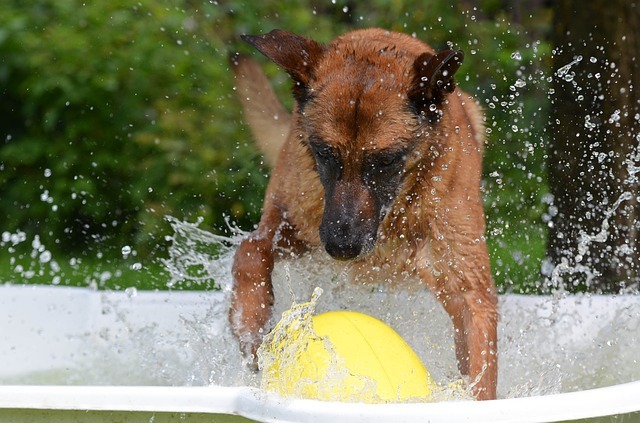 During summer, fill a kid-sized pool with water, adding a fun place to play for your dog while staying cool. Make sure you choose a kind that will stand up to those doggie nails. You can even have one built into the ground. To make your yard an ultimate dog-friendly space, be sure to add their favorite toys. You are sure to keep your furry family member entertained and comfortable, by incorporating these ideas. Check out these other dog friendly backyard ideas. Speak to us at Architectural Landscape Design for help building your dream dog-friendly backyard. We can help bring your landscape visions to life – even if those dreams include your dog. We are a licensed MN landscape design and installation contractor, serving the entire Minneapolis metro area, plus surrounding Minnesota and western Wisconsin communities.